The insurance industry calls these things "Acts of God". I guess He wasn't happy with what He got on his birthday. (CNN) — Many people are feared dead after the largest earthquake to shake the planet in nearly 40 years jolted Southeast Asia Sunday. The quake prompted a series of powerful aftershocks and tidal waves in Sri Lanka, Thailand and Indonesia's Sumatra Island, according to the U.S. Geological Survey's National Earthquake Information Center. Police say 10 people are feared dead after massive tidal waves struck Sri Lanka, The Associated Press reported. In Indonesia, nine people are reported dead, and in Thailand, an official said four tourists were killed in the southern tourist resort of Phuket as a result of the quake. The initial quake, measuring 8.5 in magnitude, struck off the western coast of Sumatra around 7 a.m. local time (7 p.m. ET) and was followed by at least six moderate to strong aftershocks in the following hours. The 8.5 quake is the strongest temblor to hit since 1965, according to geophysicist Julie Martinez with the NEIC, which monitors worldwide earthquakes. In Indonesia's restive Aceh province, nine people died in a flash flood following the earthquake, local radio reported. "I saw four bodies of kids and five bodies of adults," one resident identified as Mustofa told El Shinta radio, agencies reported. In Thailand it wasn't clear how the tourists, who were on a popular Phuket beach, died, said Sorat Susaeng, of the Narenthorn Center of the Public Health Ministry, AP reported. The center also reported that people were swept off a Phuket beach by tidal waves surging as high as five meters (16 feet) after the earthquake hit near the Sumatra. It wasn't clear if the people swept off the beach were the people who died. Thousands of people fled their homes in the Aceh provincial capital Banda Aceh when the tremor struck, the official Antara news agency said. Residents in North Sumatra's capital, Medan, reported a strong tremor that caused panic among residents. "It was quite strong. We ran out of our houses but we're now back inside," said one resident. The tremor could be felt as far away as Singapore and India. An earthquake measuring 6.4 on the Richter scale rattled Indonesia's eastern Papua province in November, killing 29 people in the coastal town of Nabire. Indonesia, an archipelago of 17,000 islands, lies along the Pacific Ring of Fire where plate boundaries intersect and volcanoes regularly erupt. BANGKOK, Thailand — (UPDATE) Huge tidal waves struck southern Thailand's popular resort island of Phuket Sunday, sweeping at least four foreign tourists out to sea, sinking boats and forcing the evacuation of hotels, officials said on state radio. "As of now there are four foreign tourists missing and we are conducting a search," deputy Phuket governor Pongpao Ketthong said. Phuket's major beach town, Patong, was flooded and extensive damage had been reported from a series of two-meter (6.5-foot) high waves that slammed the tropical island's west coast at about 8:30 am (0130 GMT), a rescue worker said. "Many tourists were swept into the sea" but exact numbers were not known, the rescue worker, Mongkol Ketsunthorn, said on the radio. Christmas and new years are peak seasons in Phuket, a resort island that sees hundreds of thousands of foreign visitors each year. "Tourists were also on the [nearby] beaches of Karon, Kata and Kamala when a giant wave suddenly hit and swept everything up into the sea," he added. He said all shops, kiosks and hotels along Patong beach were damaged by the tsunami, which were the likely result of a massive earthquake that struck west of the Indonesian island of Sumatra early Sunday, which the US Geological Survey said measured 8.5 on the Richter scale. Several international hotels were completely evacuated on emergency police orders. Hotels on Patong were not answering their telephones. "Police came to the hotel and ordered all guests to leave immediately," a manager at the Panwa Beach Resort on Phuket's southwest coast told Agence France-Presse, adding that the waves had not caused extensive damage at her property. Frantic relatives of boatsmen, some of whom apparently captained tourist boats in Phuket waters, called in to say the boats had capsized or went missing. Tourists and residents were reported rushing to higher ground or clogging the road routes to the north heading off the island, which is connected to the Thai mainland by a road bridge. PHUKET: — Emergency response units have been scrambled after waters off Phuket surged onto land this morning, washing away homes on the east coast and causing damage at resorts all along the west coast. The sea rose after tremors from an earthquake just before 7 am off Sumatra, Indonesia, that measured 8.1 on the Richter scale. At 11 am, Phuket International Hospital confirmed that at least 10 people had been admitted for serious injuries, and that many more were expected to arrive. At Bangkok Phuket Hospital, many other injured people had been received, though a total could not be provided. 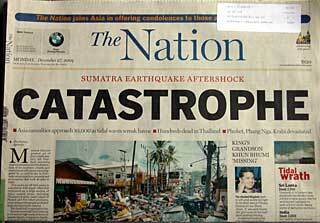 The Gazette has received reports of deaths in Kalim, in Thalang, though that report has yet to be confirmed. Kawee Sukunthamath, Chief of the Phuket Office of Disaster Prevention and Mitigation (ODPM), has told the Gazette that homes along the west coast are being evacuated as a precaution. The move follows waters at Khao Khat, on the east coast, reaching up to about 300 meters inland, washing coastal homes and vehicles away. People were holding on to whatever they could to stop from being swept away. In Patong, Gazette columnist Woody Leonard reported, "A giant wave went up the beach, at least as far up as Beach Rd ... People were running from the beach as fast as they could. The beach is devastated ... There were a lot of people on the beach, [and they were] swept away by the wave." The waters reached as far inland as the Club Andaman Resort. K. Kawee said that the tremors were also felt in Phang Nga, Ranong, Krabi, Trang and Pattani. The Gazette received a report that the surge left a Royal Thai Navy ship at Tab Lamu naval base beached. Due to network problems due to extremely high traffic, you might experience problems to access the thaivisa.com website. At least 200 people dead in Phi-Phi Islands and Phuket. 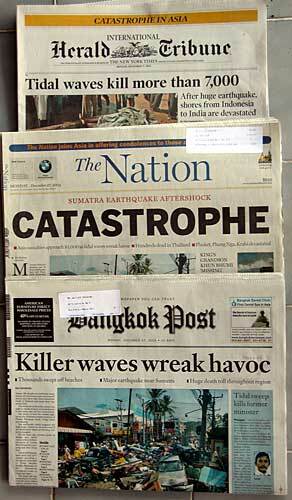 Quake, Tsunami hit South Asia, 1,500 feared dead More info will follow. It is an 8.9 earthquake. M=7: "Major" earthquake, causes serious damage up to ~100 km (recent Taiwan, Turkey, Kobe, Japan, and California earthquakes). M=8: "Great" earthquake, great destruction, loss of life over several 100 km (1906 San Francisco, 1949 Queen Charlotte Islands). M=9: Rare great earthquake, major damage over a large region over 1000 km (Chile 1960, Alaska 1964, and west coast of British Columbia, Washington, Oregon, 1700). The magnitude of an earthquake is a measure of the amount of energy released. Each earthquake has a unique magnitude assigned to it. This is based on the amplitude of seismic waves measured at a number of seismograph sites, after being corrected for distance from the earthquake. Magnitude estimates often change by up to 0.2 units, as additional data are included in the estimate. The Richter scale is logarithmic, that is an increase of 1 magnitude unit represents a factor of ten times in amplitude. The seismic waves of a magnitude 6 earthquake are 10 times greater in amplitude than those of a magnitude 5 earthquake. However, in terms of energy release, a magnitude 6 earthquake is about 31 times greater than a magnitude 5. The intensity of an earthquake varies greatly according to distance from the earthquake, ground conditions, and other factors. The Modified Mercalli Intensity Scale is used to describe earthquake effects. PPPS: God keeps striking back ... He is so pissed about His Son's shoddy Xmas presents ... I guess the Kid did not get the latest Game Boy. The Man is blaming Asia ... where all the trendy software is now penned. (CNN) -- Massive tsunamis triggered by the largest earthquake to shake the planet in over 40 years have wiped out coastal areas across southeastern Asia, killing more than 3,600 people -- most of them in Sri Lanka and India. The initial quake, measuring 8.9 in magnitude, struck about 100 miles (160 km) off the coast of Indonesia's Sumatra island around 7 a.m local time Sunday (0000 GMT), according to the U.S. Geological Survey's National Earthquake Information Center. It is the fifth largest earthquake in recorded history, according to the NEIC. Sri Lankan authorities are reporting over 1,700 people killed, most of them in the eastern district of Batticaloa. Several districts in the country's south have still not reported casualty figures, and authorities fear the death toll could rise. The huge waves also swept away a high security prison in Matara in southern Sri Lanka, allowing 200 prisoners to escape. Eyewitnesses in eastern Sri Lankan port city of Trincomalee reported waves as high as 40 feet (12 meters), hitting inland as far as half a mile (1 km). Sri Lankan officials imposed a curfew as night fell, and tourists were being evacuated from the eastern coasts to the capital, Colombo, unaffected on the west coast. Steven Evans, the British High Commissioner to Sri Lanka, told CNN the island nation needed help in rescue efforts. India has agreed to help assist Sri Lanka, sending two naval ships to the resort town of Galle, in the south, and Trincomalee, according to Colombo officials. Indian aircraft will bring in relief supplies to the country on Monday. India itself is reeling from the aftermath of the quake. 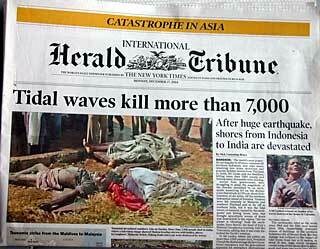 Interior Minister Shivraj Patil said at least 1,000 were killed as a result of the massive waves. A resident of Chennai (formerly Madras) in Tamil Nadu district -- the hardest hit area -- said he witnessed several people being swept away by a tidal wave there. Along India's southeastern coast, several villages appeared to have been swept away, and hundreds of fishermen who were out at sea when when the massive waves swept across the waters have not returned. Patil told CNN 700 people were killed in Tamil Nadu and 200 in Andhra Pradesh. Poor communications with India's remote Andaman and Nicobar islands, which were closer to the quake's epicenter, has prevented any reports of damage and casualties. Most of the 14 aftershocks have been centered off these islands. Thai authorities say nearly 400 are feared dead -- most of them, at least 200, on the small island of Phi Phi, between Thailand's coastal area and the resort island of Phuket. 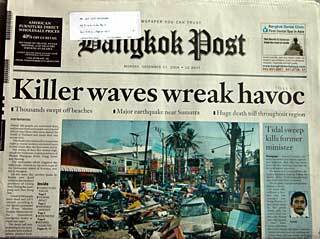 On Phuket -- one of the region's most popular tourist destination -- at least 150 are reported dead. One witness said Phuket's Laguna Beach resort area is "completely gone." Phuket's airport, which closed down when its runways flooded, reopened, and many of the island's roads were passable. Thai Prime Minister Thaksin Chinnawat arrived in Phuket and said the situation was "under control." He told CNN he planned to stay the night and direct rescue and relief efforts. 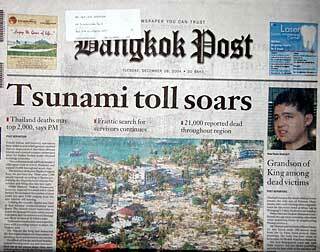 NEIC geophysicist Don Blakeman said there was also a report that an entire coastal village in Thailand was destroyed by a tsunami. Over 500 people were killed Indonesia by the quake and the following tidal waves -- many of them in Aceh, in northern Sumatra, about 100 miles from the quake's epicenter, according to local reports. JAKARTA, Indonesia (Dec. 26) - The world's most powerful earthquake in 40 years triggered massive tidal waves that slammed into villages and seaside resorts across southern and southeast Asia on Sunday, killing more than 7,000 people in six countries. Tourists, fishermen, homes and cars were swept away by walls of water up to 20 feet high that swept across the Bay of Bengal, unleashed by the 8.9-magnitude earthquake centered off the west coast of the Indonesian island of Sumatra. In Sri Lanka, 1,000 miles west of the epicenter, more than 3,000 people were killed, the country's top police official said. At least 1,870 died in Indonesia, and 1,900 along the southern coasts of India. At least 198 were confirmed dead in Thailand, 42 in Malaysia and 2 in Bangladesh. But officials expected the death toll to rise dramatically, with hundreds reported missing and all communications cut off to Sumatran towns closest to the epicenter. Hundreds of bodies were found on various beaches along India's southern state of Tamil Nadu, and more were expected to be washed in by the sea, officials said. The rush of waves brought to sudden disaster to people carrying out their daily activities on the ocean's edge: Sunbathers on the beaches of the Thai resort of Phuket were washed away; a group of 32 Indians - including 15 children - were killed while taking a ritual Hindu bath to mark the full moon day; fishing boats, with their owners clinging to their sides, were picked up by the waves and tossed away. The U.S. Geological Survey measured the quake at a magnitude of 8.9. Geophysicist Julie Martinez said it was the world's fifth-largest since 1900 and the largest since a 9.2 temblor hit Prince William Sound Alaska in 1964. On Sumatra, the quake destroyed dozens of buildings - but as elsewhere, it was the wall of water that followed that caused the most deaths and devastation. 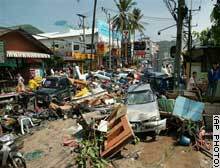 Tidal waves leveled towns in the province of Aceh on Sumatra's northern tip, the region closest to the epicenter. An Associated Press reporter saw bodies wedged in trees as the waters receded. More bodies littered the beaches. Health ministry official Els Mangundap said 1,876 people had died across the region, including some 1,400 in the Aceh provincial capital, Banda Aceh. Communications to the town had been cut. Relatives went through lines of bodies wrapped in blankets and sheets, searching for dead loved ones. Aceh province has long been the center of a violent insurgency against the government. 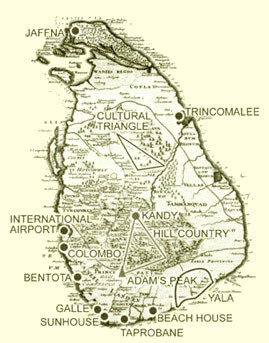 The worst known death toll so far was in Sri Lanka, where a million people were displaced from wrecked villages. Some 20,000 soldiers were deployed in relief and rescue and to help police maintain law and order. Police chief, Chandra Fernando said at least 3,000 people were dead in areas under government control. In India, beaches were turned into virtual open-air mortuaries, with bodies of people caught in the tidal wave being washed ashore. In Tamil Nadu state, just across the straits from Sri Lanka, 1,567 people were killed, said the state's top elected official, Chief Minister Jayaram Jayalalithaa. Another 200 died in neighboring Andhra Pradesh state, 102 in Pondicherry and 28 others in Kerala and elsewhere, according to the governments in each state. The huge waves struck around breakfast time on the beaches of Thailand's beach resorts - probably Asia's most popular holiday destination at this time of year, particularly for Europeans fleeing the winter cold - wiping out bungalows, boats and cars, sweeping away sunbathers and snorkelers, witnesses said. On Phi Phi island - where "The Beach" starring Leonardo DiCaprio was filmed - 200 bungalows at two resorts were swept out to sea. Quakes reaching a magnitude 8 are very rare. A quake registering magnitude 8 rocked Japan's northern island of Hokkaido on Sept. 25, 2003, injuring nearly 600 people. An 8.4 magnitude tremor that stuck off the coast of Peru on June 23, 2001, killed 74. Associated Press reporters Dilip Ganguly and Gemunu Amarasinghe in Colombo, Sri Lanka, K.N. Arun in Madras, India, and Sutin Wannabovorn in Phuket, Thailand, contributed to this report. The Government of Thailand has declared that the next three days will be days of mourning. PPS: Truth is stranger than fiction ... hey, maybe the two just merge at times. Anyway, about 30 years ago the Cambridge University Monty Python group did a skit on the Bubonic Plague: ... as an ox-drawn cart wound its way through a medieval death-by-disease slum, survivors of the plague were exhorted by the man with the whip to: "Bring out your dead ... bring out your dead ... bring out your dead ...". "In Galle, Sri Lanka, officials used a loudspeaker fitted atop a fire engine to tell residents to place bodies on the road for collection." Panel 1--Initiation: Earthquakes are commonly associated with ground shaking that is a result of elastic waves traveling through the solid earth. However, near the source of submarine earthquakes, the seafloor is "permanently" uplifted and down-dropped, pushing the entire water column up and down. The potential energy that results from pushing water above mean sea level is then transferred to horizontal propagation of the tsunami wave (kinetic energy). For the case shown above, the earthquake rupture occurred at the base of the continental slope in relatively deep water. Situations can also arise where the earthquake rupture occurs beneath the continental shelf in much shallower water. Note: In the figure the waves are greatly exaggerated compared to water depth! In the open ocean, the waves are at most, several meters high spread over many tens to hundreds of kilometers in length. Panel 2--Split: Within several minutes of the earthquake, the initial tsunami (Panel 1) is split into a tsunami that travels out to the deep ocean (distant tsunami) and another tsunami that travels towards the nearby coast (local tsunami). The height above mean sea level of the two oppositely traveling tsunamis is approximately half that of the original tsunami (Panel 1). (This is somewhat modified in three dimensions, but the same idea holds.) The speed at which both tsunamis travel varies as the square root of the water depth. Therefore the deep-ocean tsunami travels faster than the local tsunami near shore. Panel 3--Amplification: Several things happen as the local tsunami travels over the continental slope. Most obvious is that the amplitude increases. In addition, the wavelength decreases. This results in steepening of the leading wave--an important control of wave runup at the coast (next panel). Note also that the deep ocean tsunami has traveled much farther than the local tsunami because of the higher propagation speed. As the deep ocean tsunami approaches a distant shore, amplification and shortening of the wave will occur, just as with the local tsunami shown above. Panel 4--Runup: As the tsunami wave travels from the deep-water, continental slope region to the near-shore region, tsunami runup occurs. Runup is a measurement of the height of the water onshore observed above a reference sea level. Contrary to many artistic images of tsunamis, most tsunamis do not result in giant breaking waves (like normal surf waves at the beach that curl over as they approach shore). Rather, they come in much like very strong and very fast tides (i.e., a rapid, local rise in sea level). 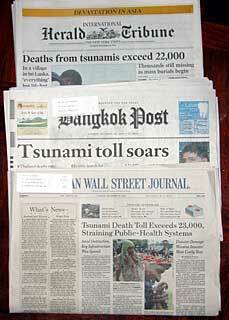 Much of the damage inflicted by tsunamis is caused by strong currents and floating debris. The small number of tsunamis that do break often form vertical walls of turbulent water called bores. Tsunamis will often travel much farther inland than normal waves. Do tsunamis stop once on land? After runup, part of the tsunami energy is reflected back to the open ocean. In addition, a tsunami can generate a particular type of wave called edge waves that travel back-and forth, parallel to shore. These effects result in many arrivals of the tsunami at a particular point on the coast rather than a single wave suggested by Panel 3. Because of the complicated behavior of tsunami waves near the coast, the first runup of a tsunami is often not the largest, emphasizing the importance of not returning to a beach several hours after a tsunami hits. Last night Watcharee and I had dinner at The Peninsula with Fred O'Leary, his wife (Sue) and their son Colin. Fred is a member of the ICCA and he is the author of a widely respected book on corkscrews. He and his family had been in Kuala Lumpur ("KL") visiting their new grandchild over Christmas and were now spending a few days in Bangkok before going on to visit Ankor Wat in Cambodia. Though I took a photograph of Fred, Sue and Watcharee while we were on the hotel boat that shuttles folks between River Garden and The Peninsula, I did not take any Gourmet-magazine-worthy shots of the food (*). But, for all you 'foodies' out there who demand a 'peek' once there is a verbal 'sniff', here is a guessing game of what Watcharee whipped up the night before (**). The trick is to put the individual dishes in the proper table-presentation sequence. (*) As well, son Colin also did not make the 'cut' on the boat scene ... but, children usually never like to be seen with Mom and Dad. After dinner he distanced himself to one of the 'darker' areas of Bangkok ... a place that I suggested: Nana! (**) Sure, this has nothing to do with last night's dinner at The Pen ... but, it is remarkably similar food. KHAO LAK, Thailand (Reuters) -- Foreign forensic experts joined the desperate race to identify Thailand's tsunami victims as the death toll and the number of missing mounted on Thursday and people gave up hope of finding loved ones alive. With much of Europe transfixed by a disaster which killed hundreds of its tourists escaping a dark, cold winter for the warmth of Thailand's Andaman Sea shores, German, Swiss, Dutch, Australian and other forensic teams started their gruesome task. On Khao Lak, the worst-hit beach in Thailand, a German team was called out late on Wednesday, shortly after arriving, because villagers thought they heard calls from people trapped inside a half-built luxury hotel. Sniffer dogs found no trace of life. 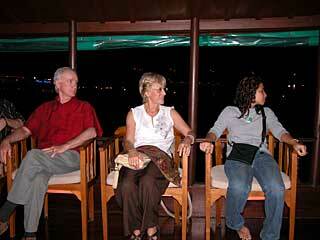 French, Italian and Danish teams were also in Phuket -- one of Asia's premier resort islands, just south of Khao Lak. A New Zealand team was on the way. "It will be challenging," said Karl Kent, head of a 17-member forensic team from the Australian Federal Police of the kind sent to Bali in the wake of the 2002 bombings that killed 202 people. "The scale is of a magnitude that Australia and other countries have not experienced," he said. The death toll from the tsunami, triggered by a magnitude 9.0 earthquake off Indonesia on Sunday, is more than 87,000 people. In Thailand, the government said at least 1,976 were known to have died and 345 of them were foreigners -- the first time it has issued a separate number in its national toll. The final toll will certainly be much higher, with local police saying more than 1,800 bodies have been recovered from Khao Lak alone. Police believe as many as 3,000 people may have died around Khao Lak when the wall of water rolled up the gently sloping beach -- which made it an ideal family holiday spot with safe swimming for children. It smashed into a line of luxury hotels and drove up to 1 km (1,000 yards) inland from a beach particularly popular among Scandinavians and Germans. More than 2,200 Scandinavians, including 1,500 Swedes, are missing in countries around the Indian Ocean along with 1,000 Germans. Many of them could be among Thailand's 6,043 missing. Khao Lak is yielding at least 300 bodies a day, despite a search and rescue operation officials admit is struggling to cope in a country which rarely suffers natural disasters worse than floods during the annual monsoon. The grim task of retrieving them was interrupted briefly by a tremor which cleared the sand of people in a flash, the fear of another tsunami flashing through every mind in the stampede. How long it will take to finish finding the missing and identify the dead, nobody knows. "It's going to be a huge operation," said Australian envoy Bill Patterson. "I think it could take weeks." After days in the sub-tropical heat, most of the bodies are beyond recognition and survivors searching for loved ones are faced with gruesome mosaics of photographs at Buddhist temples used as a temporary morgue. For some, there no photographs, only hints -- a watch, a ring, a mobile telephone. Briton Rob Ward was handing out photographs of the young son of a friend in what he acknowledged was a vain attempt to find someone who might know he is alive. "It would be some comfort for the parents to know definitely what happened," he said. The forensic teams will collect dental evidence and DNA samples, take fingerprints, photographs and X-rays, and will look for jewelry or documents that may help identify bodies. An immediate need was refrigeration to preserve bodies and Prime Minister Thaksin Shinawatra promised refrigerated containers. Aid teams were also starting to worry about disease on the coast, where local sources of drinking water are likely to have been contaminated by sea water. "We are very concerned that there will be later disease outbreaks in places with lesser availability of medical and public health facilities," said Australian Drew Richardson, part of medical team from Canberra Hospital. I have known Geoffrey for a long time. He is an excellent elephant polo player. He has played in Nepal and Thailand as well as in his own Sri Lanka. In fact, Geoff hosts the annual Sri Lanka elephant polo games. This is his tale of what happened to him on Boxing Day (December 26th). Imagine a brilliant blue sky and a calm turquoise blue sea, I had just finished my daily morning run into the paddy fields beyond the coastal road, somewhat later than usual due to the Christmas festivities of the day before. I plunged into the sea and started swimming around the small island home I own 200 metres offshore. The time was 9.15am. Having swum about a hundred yards I suddenly realized that I was getting nowhere and I cursed myself for being so unfit, about 30 seconds later I suddenly realized that I had risen about 30 feet, I shouted to my brother who was swimming behind to get out of the water as something strange was happening, I glanced back to the shore and saw the sea crashing into boats and fishermen rushing about trying to control them, it was too late many boats went crashing across the coastal road and into houses on the other side, my brother and I were swept along with current, luckily after a few hundred metres we managed to cling onto a fishing catamaran which had lodged itself between a palm tree and the roof of a house, we could hear the terrified screams of women and children in the houses beyond, they never stood a chance. After about five minutes the waters seemed to subside and I found myself once more resting on the side of the road, there was complete chaos in front of me, foolishly I left the boat and walked a few yards before being greeted with the returning rush of water, a local fisherman threw me a line, I looked behind me to see my brother being taken out to sea, but luckily managing finally to grab hold of a fishing boat going in the same direction, by some miracle the fishing boat came to rest on the ocean floor. by this time the whole bay of weligama had been emptied of water as far as the eye could see, it was a scene that far surpassed Moses parting of the waters in the red sea. Dazed and shocked we walked back to the island, the front gate and jetty a mangled wreck, at the bottom of the island steps we were greeted by my staff and guests all of whom had survived, some had been swimming in the pool at the time only to be lifted four feet above its surface and swept to safety along one of the coral sand strewn pathways that surround the island, we climbed the 103 steps to the house on the island summit and pondered about what had happened to us. The sea in the meantime had come back into the shores but at five minute intervals would recede back into the Indian ocean revealing once again the bottom of the ocean floor, my mind suddenly remembering that on my run I had bumped into a friend who said he was just going diving, I shuddered to think what the ocean had done to him where the next nearest land mass is the south pole. By now it was lunchtime, we eat the remains of the Christmas turkey in silence. For the rest of the day we were too shocked to do anything meaningful. We went to bed early, on waking I resolved to get my family off the island, we found a vehicle and drove the 20 km up to the Galle, we went past scenes of utter devastation, a trip that would normally take 30 minutes took 3 hours as we wound our way around debris on the coast road occasionally having to drive inland when the road became impassable, the scene inland was a complete contrast to the devastation of the coast, farmers were still tending their paddy fields, shops were full of produce, it had all the resemblance of the normal full moon poya day, my niece Alexandra suddenly broke the silence "uncle Geoffrey can I give the remains of my holiday money to help these people"
I left my family in Galle and went back to the island of Taprobane anxious to see if my diving friend had survived, incredibly his dive boat had been delayed by the late arrival of the hungover divemaster and they had not yet put to sea, we started to discuss how we could help our shattered community. I went to look for tourists who were dottered about seeking shelter in the few standing buildings, I went 50 kms further down the coast to town of Tangalle, all along the coast the scene was the same, however as the days went by one could see villagers beginning to rebuild their shattered lives. There was no sign of any government aid in these villages. i have just returned after spending nearly 4 days in phangna province. the death toll is beyond believe, we estimate somewhere around between 10 000 and 20 000 dead at least, but honestly, it is nearly impossible to put any number to it. iutrede, with who i was in regular phone contact, has more information on the relatively few survivors. basically, very few seriously injured people, mostly lightly injured, the rest is dead. i am very sorry, unbelievably sorry, but i have to say it directly. i had to do that countless times in the morgue i have stayed the last four days, and it ain't get easier. 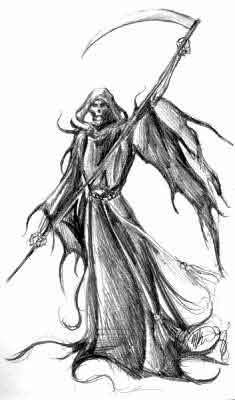 if you have not yet heard from your missing poeple, chances are that they are dead. chances are that they will never be found, and never be identified. a small minority of the corpses were gen swapped, in the morgue dr. pornthip worked. if your dead relatives were brought to wat yan yao in takuapa town, there might be a chance that they can be identified. but they are the minority of the thousands of dead and missing foreigners. don't go to identify them either now in person, as it is not possible anymore. wait until later, when it is announced if, and where you could submit a gensample. the basic problem was that during the three most crucial days nobody was there to work except a few hundred rescue volonteers, dr. pornthip, and locals. all these people did an inhuman effort, but of course it was not enough. nobody else was there - no soldiers, no foreign aid organisations, no equipment other than pure manpower. and nobody who had the capacity to take over the organisation. don't ask me any questions, i am not in the physical and mental condition to answer any. i don't know how long it will take until i can digest what i had to witness there. please spread that post wherever you can.